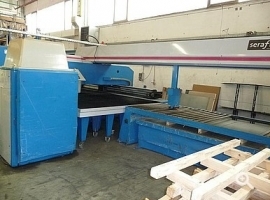 Combined punching shear Finn-Power SG6: SG6 TRS6 SBcellule cisaillageequipe punching of: 1 toles + 3 trays loading system folding out of the cisaille + 1 yard of parts tools importantannee 1998.3000x1500CN STS.Lot Siemens control 840D30 TonnesNombre of hours = 45993 hequipe of a turret 20 positions, which: 1 MT24/8 - MT10 2/16 - 7 positions B - 3 positions B Index-3 positions C - 1 position C Index-1 post D - 1 post D Index- 1 post D Forming (bottom to top) Suivant this turret configuration = 61 tools maxidiametre of maximum perforation: 89 mm.L' maximum thickness (punching): 8 mm. 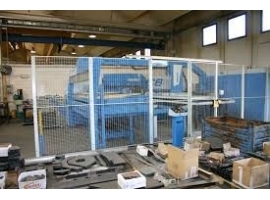 Index CNC tool: -the maximum number of indexed stations: 10 pcs. -the maximum punch diameter: 89 mm. -maximum tool Rotation: 58 r / mincisaillement integrated angle droitDIMENSIONS shot of the sheet metal MAX: 800 x 1528 maximum mmepaisseur of the material (cut) : Aluminium: 5mm. 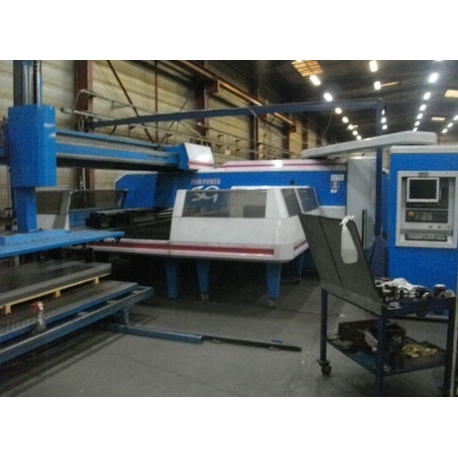 Fe 52 / Fe37 4mm steel / stainless steel: 3 mm.epaisseur of the material - Minimum: 0.5 mm.Mise blade Tolerance: manually by automatic visPinces with positioning plate: pneumatic, parts 3. 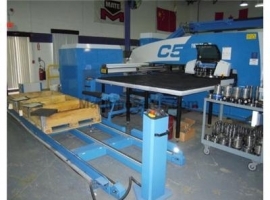 La the maximum size of the sheet metal (X / Y) 3061 mm. 1528 X mm.Course x 2584 (X-42 X 2542) Course Y: 1560 (Y-25-Y1535) maximum speed axe (x-axis): 90 m / min.axe maximum speed (y-axis): 60 m / min.